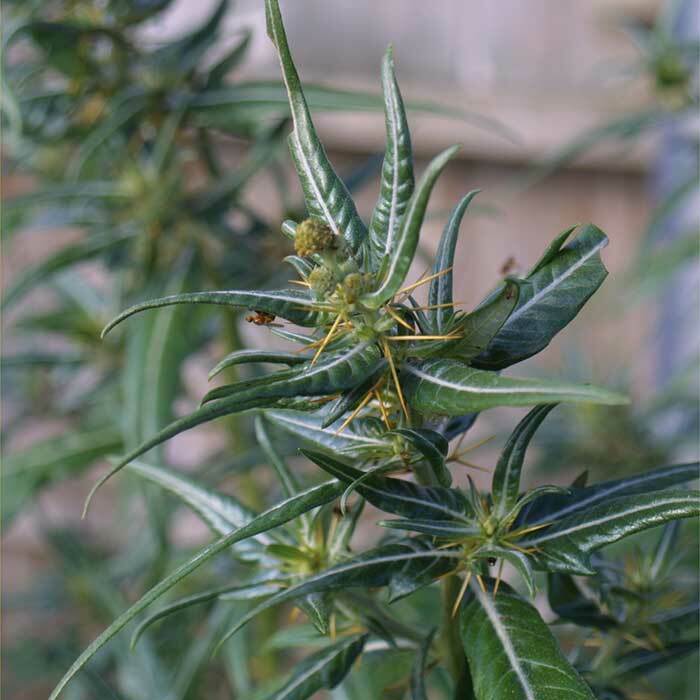 Composite flower heads comprise many small, creamy green flowers arranged in a tight clump. 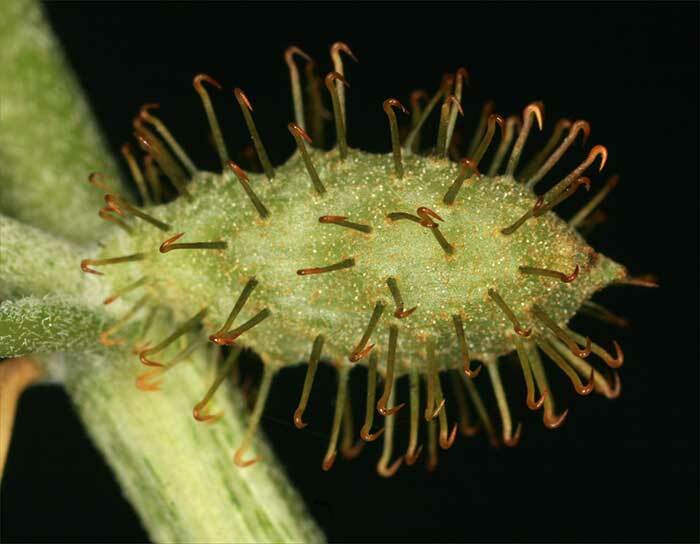 These develop into characteristic green to straw-coloured burs, each1.0–1.5 cm long, with many yellow hooked spines. Each bur contains two seeds. 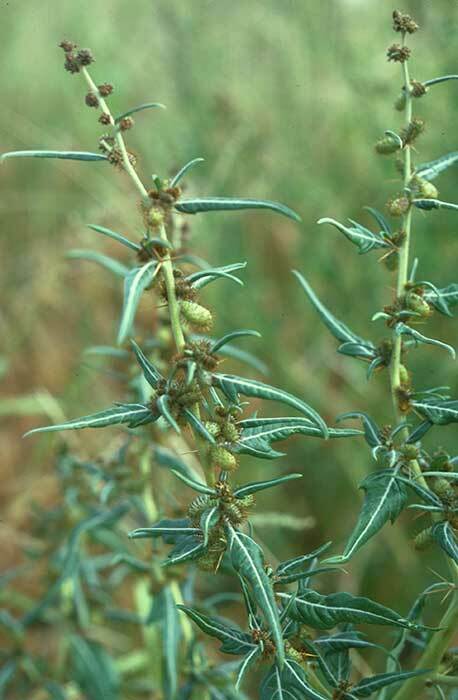 Small, creamy green flowers develop into characteristic straw-coloured burs, each1.0–1.5 cm long, with many yellow hooked spines. 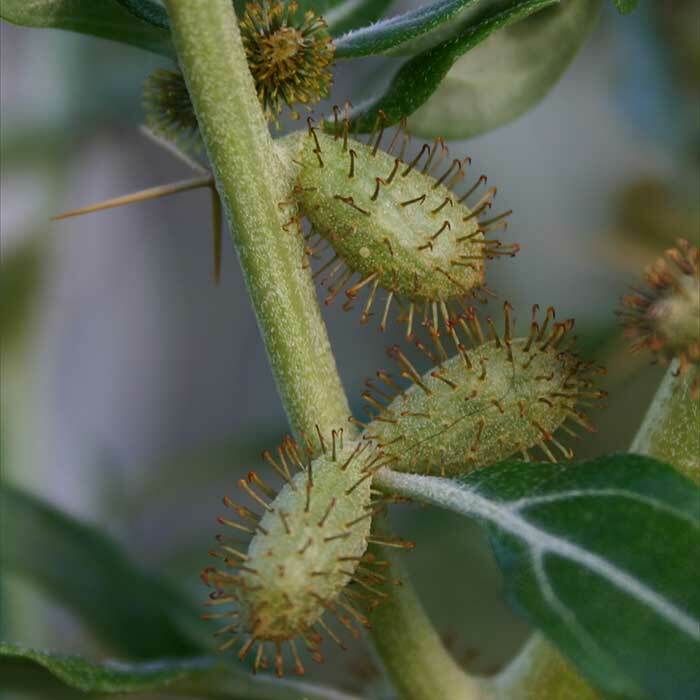 Each bur contains two seeds. 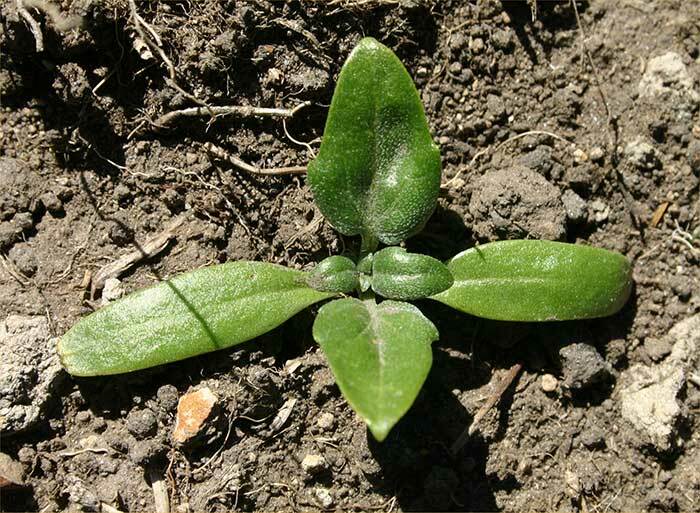 Grows in pasture, on arable land, in coastal areas and in waste places, especially where the ground is bare of vegetation for part of the year. Bathurst bur may become more widespread and problematical as climate change could result in higher temperatures and less rain in some areas. 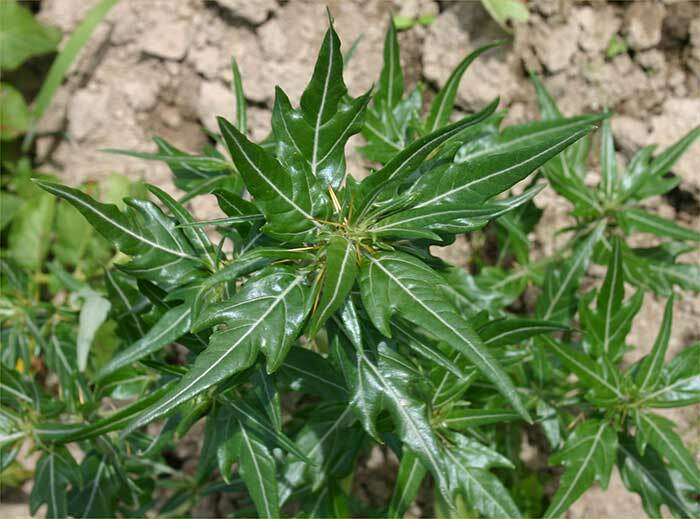 Young plants are mildly poisonous to stock, older plants have vicious spines, and produce burs that contaminate wool and socks, and can cause dermatitis in some people. Benefits? Absolutely none! A single bur in a pack of wool can lead to rejection or down grading the entire consignment. 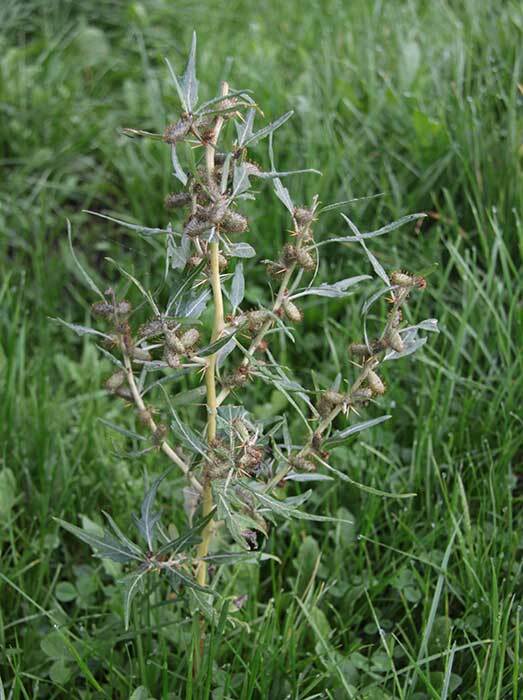 Plants can out-compete and replace desirable grasses and clovers, and the spines discourage stock from grazing close to desirable plants plants leading to poor pasture utilisation. Burs also damage the feet of sheep and other stock when they walk through dense patches. 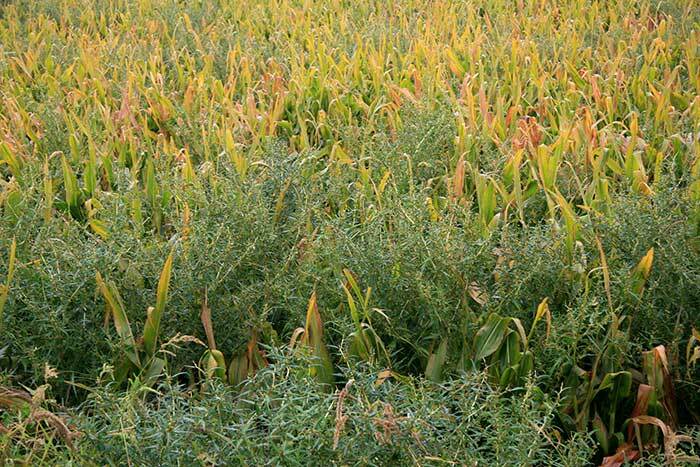 Uncertified seed in summer crops such as maize, sorghum and sunflowers can also contain burs. 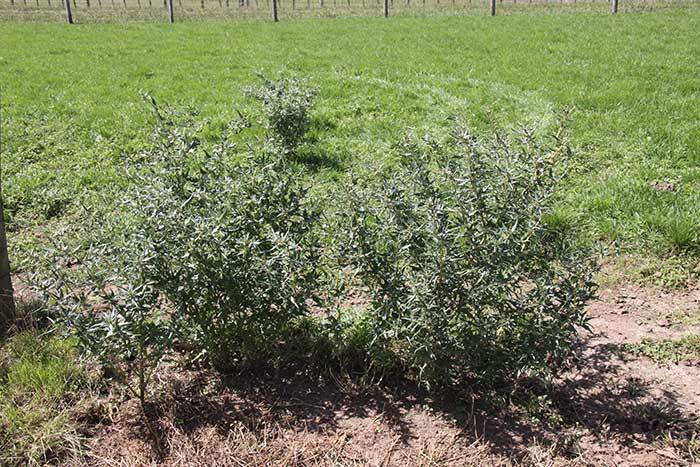 After using herbicides, competitive pastures must be maintained to reduce re-infestation. Grazing is not an effective method of control. Mowing is not usually an effective control method. Rotary slashing can be used but must be done before any burs are formed, and plants may still regrow afterwards. A dense sward of sown pasture species, especially in late spring but preferably all year round, prevents plants from establishing. Clopyralid can contaminate lawn clippings and and these must NOT be composted. It is recommended that with the exception of 2,4-D all the chemicals below only be used as spot treatments in pasture. They may be used over larger waste areas. Other insects and fungi attack Bathurst bur but outbreaks are spasmodic and none have given long-term control. Popay I, Champion P, James T 2010. An illustrated guide to some common weeds of New Zealand. NZ Plant Protection Society, Christchurch, New Zealand. 416 p.